I admit, I judge a book by its cover. As a graphic designer, it comes with the territory, and a habit it's too late to change at this point. Having said that, I will also say that this habit has only rarely let me down. 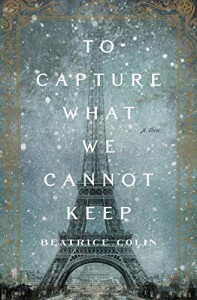 This book had the tremendous advantage of 1. featuring the Eiffel tower on the cover (compelling for me after staying within feet of it in Paris last summer), and 2. bearing a remarkable resemblance to the cover of All the Light We Cannot See, a huge favorite of mine. While I don't condone knock-off covers, this one, with a similar type layout to Doerr's book, subliminally convinced me it was going to be good. Normally I might feel manipulated, but Colin was able to follow through on the promise I felt when I first laid eyes on this cover, so I'll forgive her (and the cover designer). I am a fan of historical fiction, inspired by real events with larger than life characters and their creations. Before I visited the Eiffel Tower, I didn't know much about the controversy surrounding its creation, and the fear of it being an eyesore is surprising knowing what an icon it has become for the city, many years after it was supposed to be dismantled. There are a couple of plotlines going on here, and of course a little romance thrown in for good measure, but the true story does not require a whole lot of embellishment to make for an interesting tale. The politics of the drawing room and the social scene in Paris provide a backdrop for what becomes a compelling story with a surprisingly satisfying untidy ending.